I bought a new juicer last week. My rational was to find a juicer I could use daily to offer my family the freshest, vitamins, minerals, antioxidants, cold and flu fighting, anti aging, citrus juice possible! Juicing makes the nutrients of citrus and other fruits and vegetables more bio-available (more readily absorbed by our bodies), they taste better, are higher in nutrients and full of living enzymes!With my old juicer, I'd squeeze juice to last the whole week. That got me to thinking, "If vitamins, minerals and enzymes are reduced by 20% every 24 hours, what nutrients were still remaining in my "hand squeezed" juice by day 3? Day 4? Day 5? 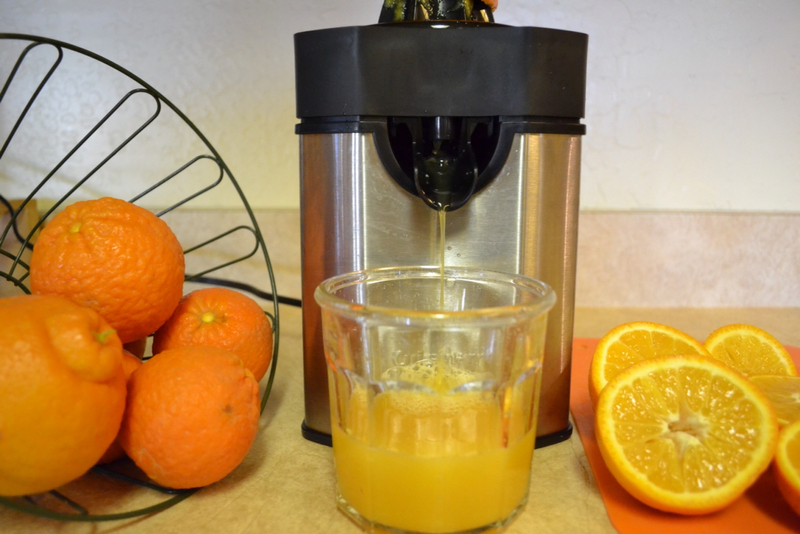 After researching the benefits of fresh tangerine, orange, and grapefruit juice, I am so pleased with my decision to buy a juicer that meets our daily needs! I had no idea there were so many wonderful properties contained in citrus that I should be taking advantage of! Vitamin C, an antioxidant found in tangerines, oranges and grapefruit, prevents damage to our cell membranes caused by free radicals. It is also known to boost our immune system to help prevent colds, flu and the duration of them. 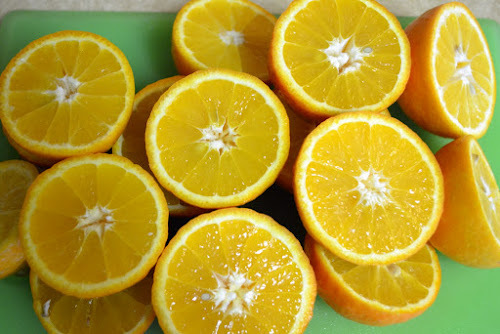 The World's Healthiest Foods website notes: "Vitamin C's anti-inflammatory effects can help it alleviate such diseases as asthma, osteoarthritis, and rheumatoid arthritis. Vitamin C also prevents the oxidation of cholesterol and can help prevent it sticking to artery walls, thereby helping to prevent heart attack and stroke. Vitamin C scavenges free radicals, which may help to prevent many cancers, particularly cancer of the colon." How much vitamin C is in orange juice? *Please note, just because the government has established a recommended daily allowance for vitamins and minerals doesn't mean we should take their recommendations as the gospel truth! We're talking about the health of our families! Grapefruit also has the antioxidant, Lycopene, which has the highest capacity to help fight oxygen free radicals and inhibit the growth of tumors! Men who consumed Lycopene rich foods were 82% less likely to get prostate cancer! It also contains vitamin B1, B5, and A for healthy eyes and potassium and magnesium. So, here's my solution to fresher, healthier juice . . . Cuisinart Pulp Control Citrus Juicer! There are three pulp adjustments ~ low, medium, high. Juice right into your glass! 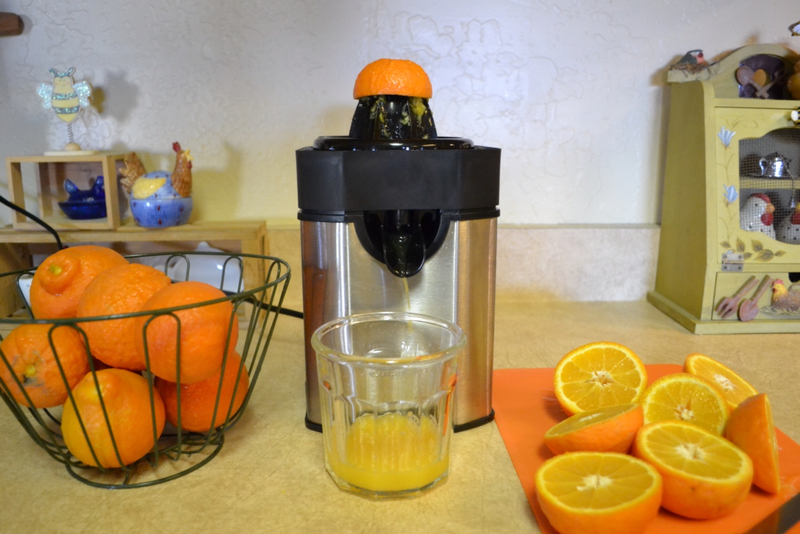 It also has a really cool feature: When I have finished juicing my citrus, I flip up the spout into the LOCK position. This will stop juice from flowing. I place the storage lid on, and press down. 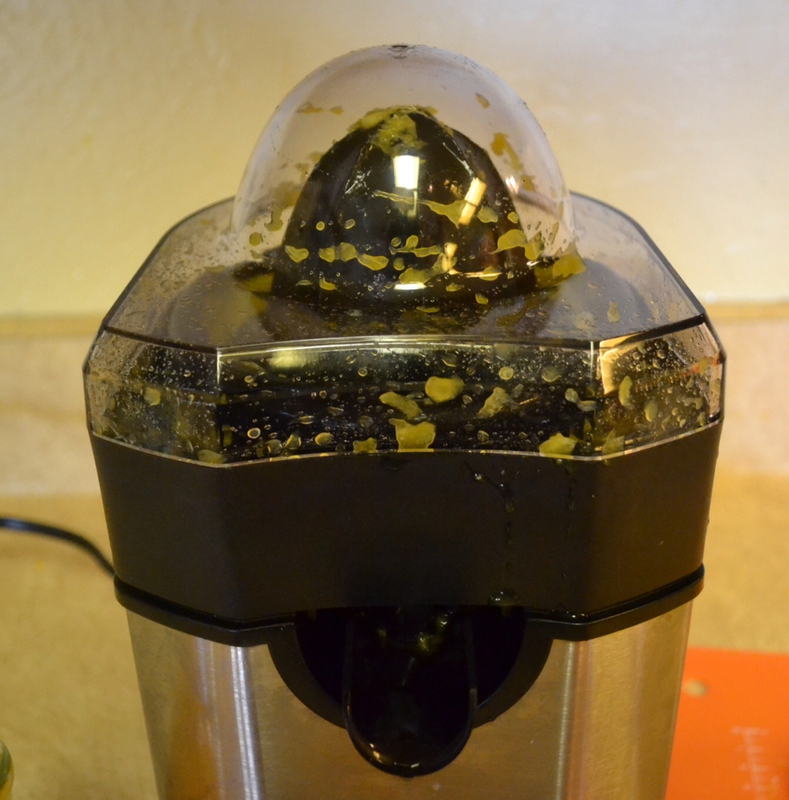 The centrifical force spins out the juice from the pulp so you get every last drop from your fruit! Attractive enough to be out on the counter, and its footprint is small! Cleanup is easy. The top section is made up of the juice container, reamer/sieve assembly and cover. These lift off the base for a quick rinse over the garbage disposal, a swish in hot soapy water, a quick wipe of the counter and stainless steel housing base and you're done! One more step towards a healthier lifestyle . . . a healthier us . . . Over at Julie's!!! Lemon Custard Pie ~ aka ~ Arizona Sunshine Pie!!! Let's have a heart to heart . . .